It's Groundhog Day in America. 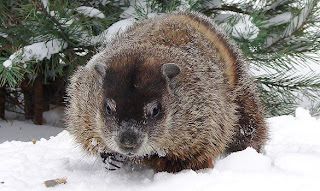 This morning, just after sunrise, in the tiny town of Punxutawney, Pennsylvania, with a crowd of thousands looking on, Phil the groundhog, was awakened from his long winter's nap to make his annual prediction. Folk wisdom says that if, on February 2nd, the groundhog sees his shadow, there will be six more weeks of winter. If not, we'll have an early spring. Only in America, land of Bill Gates and Burger King, would thousands wait with baited breath to have a large rodent predict the weather. We are an odd people, aren't we? But, Phil is surprisingly accurate in his predictions. Just for the record, groundhogs are native to North America. They resemble the European badger which is why early Pennsylvania German settlers used them for their annual prognostications for the coming planting season. They brought the custom with them from the old country and like so many such things, it stuck and acquired new life in a new land. Punxsutawney Phil did it again this morning and you can watch the bad news being announced on video below. Sorry, folks, Phil saw his shadow, so bundle up. Six more weeks of winter it is. Oh well, happy Groundhog Day anyway. He is just so damn cute!!!!! And always so happy and mild mannered. And yes, surprisingly accurate. Wrote a blog post on my blogspot today about Phil too, or rather about PETA's hope to take him from his happy home. Love the video. So cute the guy was shy to kiss Phil. I think it made Phil feel special though. Has he EVER predicted an early spring? Poor little guy - and what sense does this method make anyway? Wouldn't it have made sense if the groundhog actually made an effort to rouse himself and pop his head up, indicating spring might actually be in the air? If you drag me out of bed in the middle of a sound sleep, surround me with thousands of aliens and a marching band, I'm likely to bite someone, too.